The Louisiana Haynesville rig counts also showed a strong increase over the past two weeks. There was lots of movement and a few new rigs. The Louisiana count now stands at 133, up six from last week (and seven from two weeks ago when I last reported). 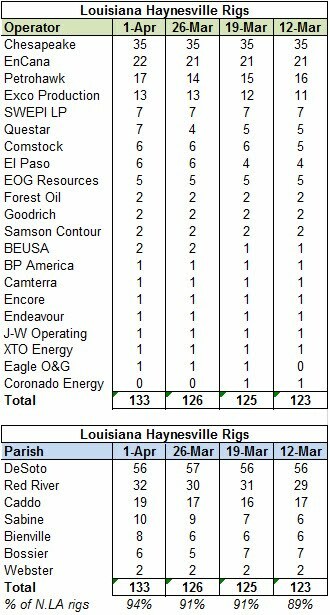 Combining Louisiana and Texas, the Haynesville rig count now stands at 177, up 12 rigs from two weeks ago. Over that same period, the spot price of natural gas has dropped 7.5%. The companies showing the strongest growth were Questar, Petrohawk and El Paso. Over the course of the past four weeks, ten new Haynesville rigs have been added in Louisiana. I'll be interested to watch the Chesapeake Energy rig count over the next couple of months. Last week the company announced that it would drop 20 of its 118 rigs operating in the U.S. So far, Chesapeake is holding steady, but let's see what the next couple of months bring. In terms of geography, Sabine Parish is showing strong growth with a total of ten working rigs. Over the course of the month, Sabine has vaulted over Bossier and Bienville Parishes to fourth place on the Louisiana list.